PowerTrekk. Portable fuel cell charger. 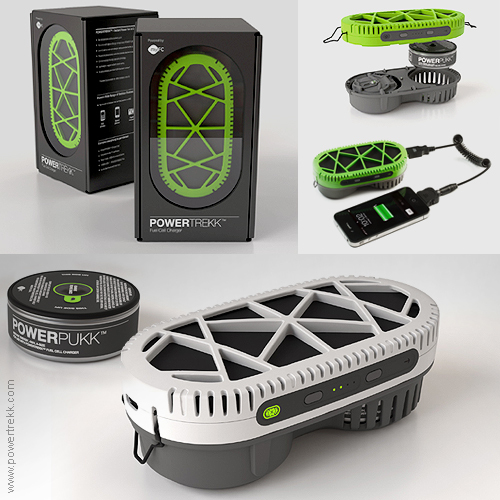 PowerTrekk is a pocket size, lightweight fuel cell charger for electronic equipment such as mobile phones, digital cameras and GPS devices. The rugged, waterproof casing and robust technology on the inside is designed to provide instant and reliable power anywhere away from the electricity grid, making it ideal for outdoor enthusiasts and business users in emerging markets. Users simply insert a sodium silicide (NaSi) fuel pack and add water (15ml). Without fans or pumps, the fuel cell silently converts hydrogen into electricity via its Proton Exchange Membrane. The chemistry process is safe, controllable and eco-friendly, and the only bi-product from the fuel cell is a little water vapour. Materials: 1600 mAh lithium ion battery ABS, sodium silicide Powder(NaSi). Dimensions: 128x 66x 42 mm.